Archtypical bad guys, the evil counterpart to that goody-two-shoes the Paladin… but don’t feel sorry for the seven to be found in these pages, as plenty of love has been lavished on developing them into well-rounded villains all ready to give any good-aligned party a run for their money. Just as a paladin is a shining example of devotion to his deity, so is the antipaladin. The difference is the nature of the deity that the antipaladin venerates and serves… and often, the precise way in which he serves and what he does in the course of such service. Even they probably see the ‘evil’ in what they do, in what they are working towards – it’s certainly clear to the rest of us – and yet they press on, often motivated by selfish ends like personal power and other rewards, rather than pure love for their deity. The work begins with brief details of three such objects of worship, a trio of demons whose intent is to ruin, defile and destroy. These are Arachne, Lamashtu and Pazuzu. Whilst each is a well-rounded and developed being, none is tied in to anything else and so fit well with the stated purpose of providing a framework of evil to use in your own campaign world – be it homebrew or based on a published one – without difficulty. 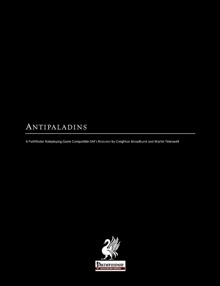 So, on to the seven fully-developed antipaladins that form the core of this book. In a departure from the usual multi-level presentation for which Raging Swan Press has already made its name, each is presented at but one level, you will need to take the individual who happens to present the appropriate challenge for your characters – or wait until they reach the right level for the antipaladin that fits in best to your needs. This latter may make for a better game, if you already know who the high-level Bad Guy is, seeds and subplots based on what he’s up to can be woven into your campaign well in advance of his actual appearance. Or he may pop up occasionally long before the characters are in a position to deal with him, messing with their heads and their plans and giving them even more incentive to gain the power and resources necessary to give him the comeuppance he so richly deserves! First up, a mere beginner in the evil stakes, a 4th-level antipaladin who’s only just begun to slide to the dark side having been thwarted in love and lacking the emotional maturity to deal with it. Finding a book about the demon Arachne, she now lives in hope of attracting the demon’s attention and favor by her deeds, manifesting this in the shape of becoming a serial killer. Plenty of atmosphere and development here, and several ideas for how your characters may encounter her. She’s followed by a young man whose descent into evil is fueled by resentment: having embraced the life of privilege that noble birth bestowed upon him he found that the quirk of fate that made him the second-born saw him sent off to become a priest without the option, where he was expected to live an austere life alongside fellows whose lesser birth led them to regard it as luxury, and study with those he considers to be of lesser intellect. No wonder when he found forbidden reading that promised to lead him to power and riches that he embraced it! He’s now busy carving out his own domains, aided by a bunch of goblins – and again plenty of ideas are provided to bring him to your characters’ attention. Next, at CR 7, comes a half-elf who has been driven to despair and turned to evil following the suicide of her parents: she now believes that life is cruel and will always end badly… and doesn’t mind helping it along a bit. A talented bard, she sings and tells tales of how ugly and nasty the world can be, and collects materials in a big book that she always carries with her. Her dark and dour performances elicit mixed reactions and frequently lead to trouble. This sad tale is followed by an outcast duergar, chipping in at CR 9, a cruel follower of Lamashtu, drinking his victim’s blood and storing their skulls in his personal shrine to his demon mistress. Next is a barbarian woman determined to lead her tribe to greatness, no matter what harm she does along the way. And she is followed in her turn by a drow who had an inauspicious start in life – thought to be stillborn, he was about to be hurled onto a funeral pyre when he cried out. A weak and sickly child, he developed an unhealthy obsession with poisons along with a devotion to Arachne, whom he credits for his preternatural stealth and the other abilities that make him a notable assassin. Finally, at the dizzying heights of CR 15, we meet the most tragic of all, one who fell from virtue as a proud example of all that is best of the paladin, whose staunch defense of her realm against darkness was brought low by exposure to an evil artifact that corrupted her very soul. It is of such as these that epic campaigns can be forged… or memorable battles against evil that are more incidental but still of significance within your alternate reality. A fine example of well-crafted villains that are not just ‘evil’ but who have their own back-story and reasons, often tragic ones, for how they are the way that they are.